The numerous tribes of India constitute the custodians of its many folk arts. Having dwelt in the obscurest recesses of the subcontinent, surviving the ravages of changing times and landscapes, each tribe has a way of life and produce a form of art that are unique. 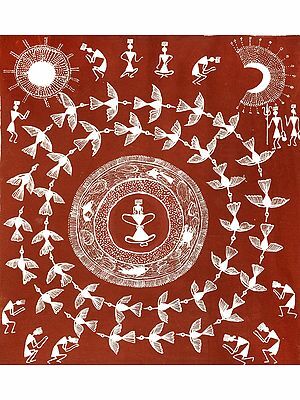 Warli is one such folk art form characterised by a charming eccentricity and spatial experimentation. The women of tribes from Maharashtra are responsible for producing and developing warli paintings, namely the Warli and Malkhar Koli tribes who reside in the northern outskirts of the capital and the western coast jutting out into the Arabian Sea. 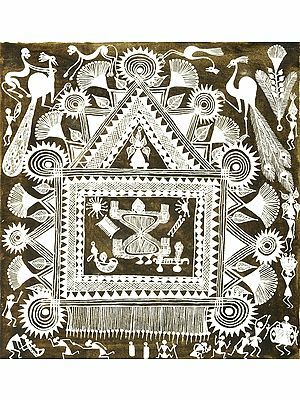 Warli paintings are like visual poetry, done in homemade white pigments against the rudimentary mud walls of their traditional dwellings. The style is rythmic, flowing, and superbly executed after the style of ancient cave paintings. And it is not just the one-of-a-kind, supra-simplistic lines and curves that set Warli paintings apart from the rest of India's folk arts. When one hears of Madhubanis and Pattachitras and Tanjores, devotional images such as popular deities and mythological characters come to mind. However, Warli paintings depict the social life of humans and as such have an earthier, more widely relatable appeal. Their unique wedding rituals, the endemic trees and animals that nourish them, and typical tribal activities such as fishing, cooking, and ploughing fields are some of the numberless themes that such a vivid subject would lend to art. The paintings that have been curated here conform to the age-old tradition of this art, and are made on cotton fabric. Pick one for your home and/or office today.